RACING UP THE CHANNEL. 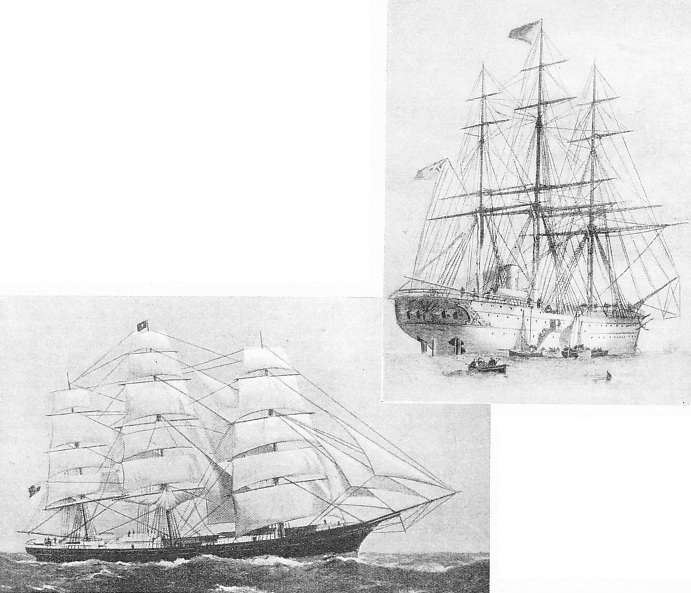 A print of two of the most celebrated clippers of the ‘sixties, the Taeping (left) and the Ariel (right). 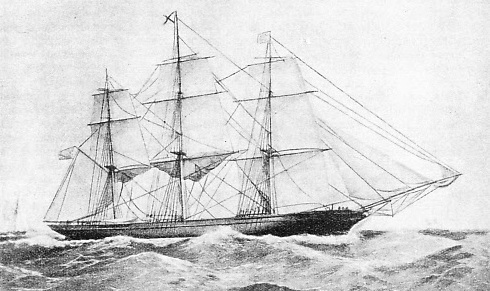 The Ariel, built in 1865, was one of the best known and most extreme of the clippers constructed for the China tea trade. She had a fine reputation while she lasted, but after seven years’ service she vanished with all hands on a voyage to Australia. THE Ariel was one of the best known of the famous China tea clippers, which were among the most interesting and romantic of all sailing-ship types. From the discovery of the charms of China tea in Pepys’s day to the cutting of the Suez Canal this trade was one of the most important for sailing ships, demanding a special and frequently modified class of vessel. Of these types the latest-designed clippers were the most interesting. The Ariel was built in 1865, a “vintage” year for clippers, by R. Steele and Sons, of Greenock, who had long specialized in the design and building of fast ships. In competition with the original clipper yards at Aberdeen, Steele had fined down the lines until the ships carried so little cargo that they could not pay on any trade except one such as the carriage of tea at high freights. The Ariel was sister, as far as sister ships were possible in sail, to the Sir Lancelot, also built by Steele, the great rivals of her year being the Ada, built by Hall, of Aberdeen, and the Taitsing, built by Connell, of Glasgow. expenses than the British East India Company, and tea was much cheaper in the Netherlands than it was in Britain. The British East India Company finally lost its monopoly of the China trade in 1832. There were already many “interlopers”, however, who had to conduct their business under the eyes of the company’s cruisers. Their ships had, therefore, been built for a higher speed than the Indiamen. The private ships which followed the opening of the trade generally had a better speed, but for years the improvement was slight and, charters with intermediate cargo being scarce, few considered more than the single voyage a year. British tea ships, therefore, sheltered as they were by the protection of the Navigation Acts, still merited the description “tea wagons” often applied to them in the ‘thirties and ‘forties. Occasionally the faster American ships visited the China coast, where they attracted attention from the shippers. As these ships were prohibited from carrying tea to England and as the American demand was small, it was not until the Navigation Acts had been repealed that they had an opportunity to influence the trade. This repeal was almost contemporary with the discovery of gold in California and with the birth of the great intercoastal trade, from the Eastern States via Cape Horn. That trade gave the big American clipper its opportunity. Westward to California there was plenty of business and little limit to the prices to be obtained. Going back, however, there was none, and the owners were glad to take their ships across the Pacific in ballast and load them in China with a tea cargo for Britain. The first American ship to engage in this practice was the Oriental, which appeared on the service in 1850, to the satisfaction of the tea shippers, who were willing to pay double freight to have their tea carried by her. She was soon followed by others that revolutionized the trade; but at the same time another vessel had been built in Britain which had an influence almost equal to that of the tall Yankees. In 1850 Jardine Matheson built the Stornaway, a smart little vessel of 506 tons. Her design was a compromise between that of the coasting vessels that had really begun the clipper type and that of the opium ships, which had to rely largely on speed for their safety. Principally because of a desire to evade the British system of measurement for tonnage, the Stornaway was much longer, narrower and deeper than her American rivals. Although later modified, this tendency in British design existed for many years. There was no doubt of the value of speed having been realized. The original Aberdeen design was developed to a high pitch, American ideas being studied carefully and incorporated in it. In her final form, therefore, the China clipper was a compromise reached after much experiment and many expensive failures. She suited perfectly the tea trade, the requirements of which were strict. Size was limited, and there was a strong bias against iron hulls, which, it was believed, spoiled the flavour of the tea, however much dunnage was employed to keep the cases away from the iron sides. Liable to encounter typhoons in China seas, the China clipper possessed seaworthiness of a high order, and, although the weight aloft was limited, everything was of the finest quality and tested to stand a great strain. As freight rates depended on the ship’s reputation for speed and safe delivery, and rose as high as £8 a ton, every precaution was taken. The noting of the performance of every ship grew into the regular race home with the new season’s tea - an exciting event. There was much betting on its result, from small fortunes among business men of the East to the traditional month’s pay of the over-worked, underpaid forecastle hands. The prize was far more than the pound or ten shilling premium that for years was paid on every ton of tea in the first cargo to be landed. Ships built for speed and driven through any weather were extremely uncomfortable for all on board. There was little passenger trade to modify the speed, as there was on the Australian run. Hands had to live in water for weeks on end, and they received little consideration, the safety of the cargo being the owners’ sole concern. The tea was carried in chests, packed closely with wood and matting dunnage over carefully washed shingle ballast. A tight ship, however, was needed to get it home without damage, and the planking of these small clippers, which were mercilessly driven, generally became soaked and began to leak badly after a few years service. They were then of no further use on the trade. Nearly every season one or more of the ships disappeared without a trace. The China clipper became the “Dainty Lady of the Sea”, just as the old East Indiaman was the “Aristocrat”. By the ‘sixties of last century the clipper type had attained a high standard, although it was doomed to be driven out of business by the opening of the Suez Canal in 1869. It was at its best in light winds and moderate weather - its size being generally too small to permit of the remarkable day’s runs of some of the big American ships - and in windward work through the south-west monsoon. In 1863 the composite system of construction - wooden planking on an iron frame - was introduced. This improved the type so much that it soon became almost universal for China clippers. The chief responsibility for the design of the Ariel, built two years later, rested with William Steele, Robert Steele’s brother. But as Captain Maxton, who was an experienced China shipmaster, was connected with the owners, he probably insisted on his views being respected. The firm of Steele had long been known for the fine lines of its clippers, especially in the run aft. In the Ariel this principle was extended farther, so that she was the finest-lined clipper in the tea fleet, having practically no counter. Thus, in a calm she could ghost along at four or five knots “by the flapping of her sails”, while others could scarcely keep steerage way. In a wind that suited her she often contrived sixteen knots. On the other hand, in a heavy sea it was a grave risk to try to run her before the wind; therefore, while her rivals were taking advantage of the wind, she often had to be hove to. HOVE TO FOR HER PILOT. The Norman Court was generally considered to be the Ariel's nearest rival in appearance, although she was not so extreme in her lines, and she was a safer ship to handle before the wind. For a tea clipper she was quite a large ship, having a gross tonnage of 1,058 on dimensions 195 feet by 33·9 feet by 21 feet depth of hold. Her carrying capacity was chiefly a matter of stowage, but she was capable of lifting over 1,400 tons on a draught which had to suit Chinese rivers. She was commanded by Captain Keay, a well-known master on the Eastern trade. He believed that a good clipper’s crew of experienced “China birds” should be as smart as that of a sailing frigate, and he used to time them at their various duties just as a man-of-war’s crew would be timed at evolutions. Captain Keay went slowly on the voyage out to China and made a thorough study of his ship. This was important with tender vessels such as clippers, which were often spoiled by wrong handling. The Ariel was particularly difficult to understand, and she had the usual number of early mishaps, mostly aloft, due to minor mistakes or skimped work. But her captain was careful to have them rectified before he had to show his ship’s paces to a critical audience of Eastern merchants. They examined thoroughly all new ships that arrived at Foochow, where £7 a ton was being paid as a freight home, with the customary bonus for a first cargo landed. The Ariel, despite her excessively fine lines and pinched stern, met with general approval. Captain Keay, who was well experienced, took advantage of the loading facilities. In a short time he had 1,230,900 lb of tea stowed on board the ship, which was the first of the fleet ready to leave, although she had the biggest cargo. At five o’clock on the afternoon of May 28, 1866, the Ariel was towed down to the mouth of the Min River, where she anchored for the night. Early next morning the Fiery Cross, Taeping and Serica also got under way, with the Taitsing only a day behind them. The Ariel’s tug was a poor one, and the Fiery Cross passed her before she bad cleared the river and made a good start. Fog caused more delay, but the time was usefully occupied in moving weights to trim the ship better. It was a popular belief that Captain Keay even filled his cabin with tea chests from the forward end of the hold. It was not until just before noon on May 30 that, off the mouth of the river, the Ariel dropped her pilot, having meanwhile been caught up by the Taeping and Serica. A series of minor misfortunes really made the Ariel’s reputation, for the three ships started with less than half an hour dividing them. With such a start, all three captains ran some risk through carrying canvas in weather that scarcely justified it. Within a few hours of leaving the river they had lost sight of one another in rain squalls and mist, although the Ariel was already showing her quality, and by nightfall had considerably lessened the others’ start. The captains knew that the Taitsing would not be far behind, but none of the other ships was sufficiently advanced in her loading to be a dangerous competitor, and from that point onwards each master had to work almost in ignorance. A China clipper’s master had open to him several minor choices that might make a great difference to her passage, especially in June, when the wind was liable to be uncertain. The passage taken between the islands until Anjer Point (Java) was passed and the open Indian Ocean entered was determined largely by a captain’s local knowledge. Each had his own theories about the channels to be taken and the way in which he should handle his ship. It was as important to be a weather prophet as to be a first-class pilot. Above all, the risk could not be taken of the lighter canvas being caught aback in the sudden changes of wind that were to be expected; on the other hand, the greatest advantage had to be taken of every puff. In 1866 conditions down the China Seas and through the islands were particularly difficult. The first four ships in the race were repeatedly catching glimpses of one another, with the early lead of the Fiery Cross being steadily reduced. This ship, the Ariel and the Taeping passed Anjer Point, the great place for timing, twenty-one days out, with the Serica two days farther astern. Then came the run across the Indian Ocean with the south-east trades, Mauritius being passed in the same order - the Fiery Cross maintaining her lead, with the Ariel and Taeping abreast and the Serica a little behind. There followed another tricky stretch, the worst weather being probable during the passage over the Agulhas Stream before rounding the Cape. The Ariel made the most of her opportunities and considerably reduced the Fiery Cross’s lead, with the Taeping twelve hours behind her and the Serica dropping back. The Taeping rapidly overhauled the leaders with a lucky slant of wind and passed St. Helena at the head of the fleet, the Fiery Cross being second and the Serica a few hours before the Ariel. Then the luck changed again. Between St. Helena and Ascension Island the Ariel greatly reduced the lead, while the Taitsing, unknown to the other competitors, was rapidly gaining on them. ANOTHER FAMOUS TEA CLIPPER, the Lahloo, This vessel was designed and built by Steele, who was responsible also for the Ariel. The two ships were rivals in the tea trade. 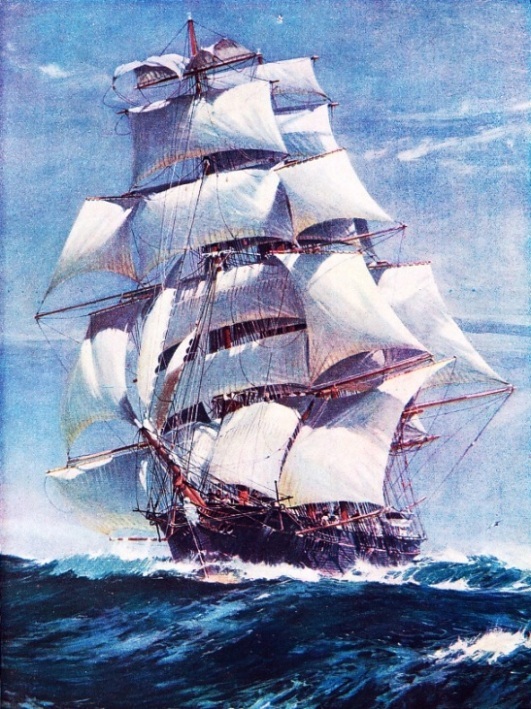 The Lahloo was constructed in 1867, two years after the Ariel, but had the older type single topsails. A number of the reports from various points had already reached home, and as the racing ships began to approach the end of their voyage excitement was intense. They seldom saw one another to exchange signals and sporting greetings, but each hailed every ship that she met for news of the others. At the Cape Verde Islands the Ariel had taken the lead, and on August 12 made her numbers (hoisted her signal flags for the purpose of identification). Next day the Taeping, Fiery Cross and Serica all passed, the last-named having made up two days’ leeway from the Equator. The Taitsing was then still six days behind. At Flores all four of the leaders made their numbers on August 29, but the Taitsing had halved her handicap. The Ariel, Taeping and Serica were then ninety-one days out, the Fiery Cross ninety-two and the Taitsing ninety-three, with another area of uncertain winds to be crossed. Fortunately, they had westerly or south-westerly winds almost throughout. At half-past one on the morning of September 5 the Ariel picked up the Bishop Rock Light in the Scillies. With the wind west-south-west, strong enough to drive her at over thirteen knots but not too strong for all her flying kites, she swept up Channel. As the light strengthened the Taeping was sighted, and the two ships raced up together. Off Dungeness, shortly before six next morning, the Ariel took on board her pilot, the Taeping being a few minutes later. The race continued until they picked up tugs in the Downs. The Taeping’s was the better tug, and she arrived off Gravesend nearly an hour ahead of the Ariel. The latter reached the entrance to East India Dock at nine o’clock, and the Taeping, London Docks, farther upstream, at ten o’clock. She was able to go straight through - while the Ariel had to wait for water - and was docked twenty minutes ahead of the Ariel. While the two ships were racing along the English coast the Serica was making equally good progress on the other side of the Channel, and eventually docked on the same tide as the Taeping and the Ariel, although a little later. Discussion followed as to which ship was entitled to the premium of ten shillings a ton and which captain to the special prize of £100, and it was finally decided to divide both rewards. As this race between sailing ships was unique, the subsequent career of the Ariel must seem to be almost an anticlimax. Never-theless, for a ship that had not been concerned in such a race it would have been a distinguished one. On her next outward voyage the Ariel broke the record between London and Hong Kong with a passage of seventy-nine days twenty-one hours, pilot to pilot, in spite of the handicap of the north-east monsoon. This record still stands. In the 1867 race she was beaten by three days by the Sir Lancelot, but outward bound she beat the Taeping by five days to Shanghai. The 1868 race was again a matter of dispute. The Ariel brought in the first cargo, but the Spindrift beat her on time. By then, however, the premium for the first cargo landed had been abandoned. Captain Keay resigned his command in 1869.
her out to Australia. The Ariel failed to arrive and her fate is a mystery. What happened to her on that voyage will never be known, though many conjectures have been made. As the year 1872 was a bad season for Antarctic ice, one suggestion is that she hit an iceberg and foundered. On the other hand, there was her proved inability to run before a strong wind with her fine after-lines. It is generally considered more probable, therefore, that she was pooped by a big sea and sank in the Indian Ocean. The life of the Ariel was thus only seven years, but during those seven years she made sailing-ship history. On her first homeward voyage from China she all but carried off the highest honours, sharing the premium with the Taepinq. On her second outward voyage to China the Ariel set up a record that has never been beaten. AN EXPERIMENTAL AUXILIARY STEAMER, the Far East was built for the tea trade in the ’sixties, with a full spread of canvas and sufficient steam power to take her through a calm. When under sail, to prevent the screws from impeding the progress of the ship they were lifted into recesses in either quarter of the ship. As with most auxiliary ships of that time, she did not prove a great success. To the left is another print of the famous but ill-fated Ariel. This colour plate of the Ariel was included with part 1. The artist is not identified, but the plate appears to be taken from “Ariel and the Taeping Tea Race 1866” by Jack Spurling (1926). 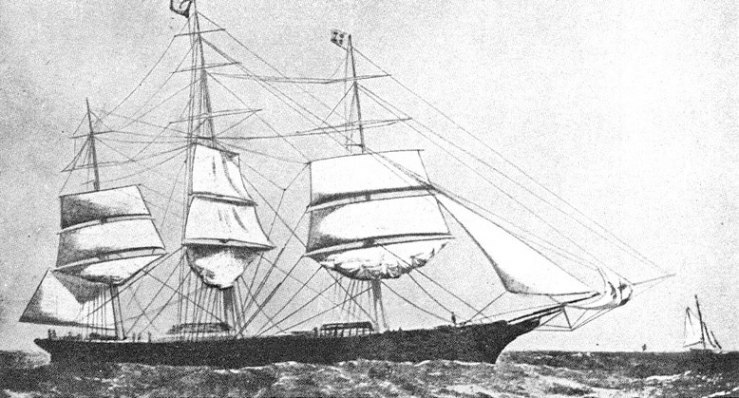 THE ARIEL of 1865 was one of the most extreme of the clippers built for the China Tea Trade. She had a length of 195 feet, a beam of 33·9 feet, a depth of 21 feet, and a gross tonnage of 1,058. The vessel was unusually fast in some conditions, but to get this speed her after lines were made so fine that it was dangerous to let her run before the wind in heavy weather. This probably accounted for her disappearance without trace in 1872.